A USS West Virginia (BB-48) sailor, wearing the "tank" suit for salvaging the stricken ship, stands by at frame 63, near an air-dropped Type 99 Number 80 Mark 5 1,760 pound (800 kilogram) modified 16-inch (406 mm) naval shell from a Nakajima B5N2 Type 97 carrier attack bomber that penetrated through the foretop, down through the flag bag, boat deck, and originally thought to have exploded on the main deck or second deck, causing significant damage. Burning gasoline from the wrecked Vought O2SU Kingfisher floatplanes drained into the bomb hole, causing fires below. 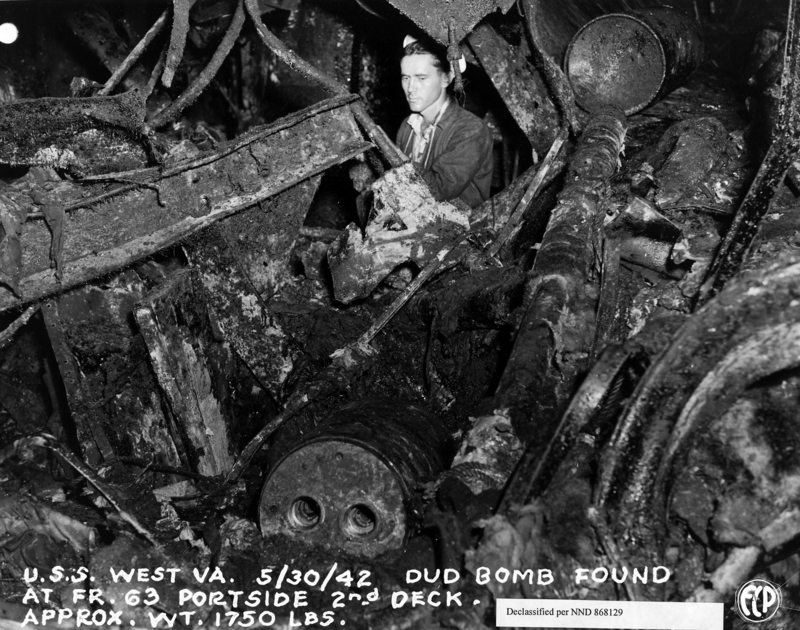 When the ship was re-floated on May 17, 1942, surveyors discovered that seven, not six, torpedoes struck West Virginia; the damage seen in this view was from the torpedo hit. The torpedo set lead paint on fire on the other side of bulkheads even when it didn't penetrate, causing fires to spread. A second dud bomb hit passed through the top 4-inch (100 mm) armor plate of Turret III and broke up. The unexploded bomb and the bomb fragments was taken for further study. Modern analysis of the torpedo attacks on West Virginia have indicated that she was struck by nine, not seven torpedoes. The Japanese never used the Type 99 Number 80 shell in combat again, choosing to upgrade the fuses after so many shells failed to explode.